I watch movies and tv. Alot. I'm not thrilled with commercial television, so I subscribe to HBO and Netflix. HBO is immediate. Netflix, I have to wait a little. BUT, and this is a big but, Netflix is pretty cool because they have bunches of titles to choose from, and they ship from distribution centers all over the US. Some are as close to my house as 15 or 20 miles away. So the turn around is quick. But sometimes, I get impatient and I turn to cable tv. And more often than not, I am disappointed. It's the same stuff, over and over again. Well, not too long ago, Quilly featured an ad on her blog for a Roku player. I didn't look at it right away. I thought I knew everything there was to know about Netflix. But today when I could find nothing I cared to watch on tv, I went to Quilly's blog for entertainment. I noticed her ad and checked it out. I just wish I had looked at that ad earlier because the Roku player will, in connection with my PC and my tv, stream 17,000 Netflix titles to my tv instantly. Honestly, I thought I had become bored and gone to tv heaven. I knew I could stream movies and tv shows instantly to my computer, but to my tv? I can search the Netflix titles on my tv while lying prone with pillows and blankies? This is a dream come true. That Roku player is going to be mine. They're cheap and easy to set up and I will be watching stuff I like within minutes of receipt of that player. The people in my house will no longer be able to speak to me because I will be absorbed in blips of light and sound. If I have to I will use Colleen's noise cancelling headphones to block them all out! Aboslute immersion in movies is in my future! 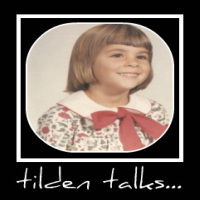 Tilden... YOU are the Anti-Melli! ROFL! I have not watched television in about 10 years now... and I've seen MAYBE 5 movies in that time frame! How DO you DO it??? I would LOSE my MIND! And I will speak until I turn blue even if you are not listening to me. If I have to I will wake you in the middle of the night by poking you with a bamboo stick so you will listen.